Of these, which is most urgently needed to meet the #COP23 /Paris goal of "well below" 2°C warming? Upon seeing these poll results, a friend commented that most people who voted for “shift in consciousness” probably think that others, and not they themselves, have yet to make the shift. If he is right, the “shift” vote comes from people who think of themselves as already having crossed over to the other side. But have they — have we? Just what “consciousness” in this case means, or what the “shift” might require of us, remains unclear; and one weakness of this poll (it has many, as Joanna Boehnert and others were right to point out) is that it does not specify what that shift might involve. I’ve seen people toss the phrase around, and included it here hoping to get a better sense of what they mean by it. Are we talking about widespread public awareness of climate risk, or the knowledge that human activity has caused the climate to change, or the conviction that we can — and must — do something about it? Are we talking about hope? The defeat of climate despair? A new view of the world and our place in it? No matter how we may choose to define the shift, it would seem that we have to continue to root out denial, as John Rehm suggested. To be effective, any “shift in consciousness” would at the very least require that people take responsibility. That in itself presents a formidable task, especially here in the United States, where an entire political party is dedicated to climate change denial. But it’s also a problem all over the place, everywhere we turn, if we think about how many of our everyday actions involve denial or willful blindness, and how easily our acts can contribute to “a set of acts” that together will cause harm (to borrow Parfit’s phrase). This is why, as Orla De Díez remarked, we have to design to make it “easier for people to behave more sustainably.” We can’t wait for some great awakening. This entry was posted in Louis V. Galdieri's Blog and tagged awakening, behavioral change, change, climate change denial, climate risk, conviction, denial, design, despair, hope, Joanna Boehnert, John Rehm, knowledge, Orla De Díez, responsibility, shift, shift in consciousness on November 7, 2017 by lvgaldieri. Haul road construction for Eagle Mine has already polluted the Salmon Trout River, but unless you’ve been following the Eagle Mine story closely you wouldn’t know that after reading in the local paper about this minor disaster: a road crew’s accidental “exposure” — or rupture — of a perched groundwater seep. 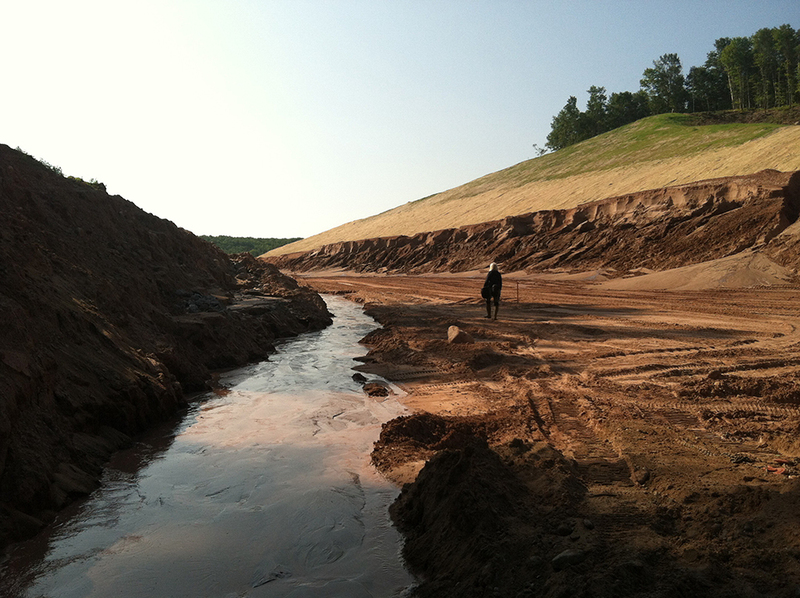 “Dirty Roadside Runoff,” by John Pepin, a Marquette Mining Journal staff writer, never once mentions Eagle Mine or Eagle’s parent company, Lundin Mining. Pepin is scrupulous at least in this regard: he keeps the mining company clean. (The Mining Journal is available online to subscribers only, but you can read it on a phone or tablet if you download the paper’s free app). The front page item sidesteps any mention of Eagle, laying the “unlawful discharge of sediment and turbid water to a wetland ravine” — which violates the Natural Resources and Environmental Protection Act — at the feet of the Marquette County Road Commission. The Michigan DEQ sent a violation notice directly to the Road Commission on August 4th; to date, so far as I can tell, Lundin Mining and Eagle Mine were not put on notice either by the DEQ or the EPA. Nor, it seems, will the local press hold the mining company accountable. Instead, the Journal seems to have taken pains to keep the company’s name out of the dirt, and keep the reading public in denial. (Those looking for a more honest and more informative account will find it here, on the Yellow Dog Watershed Preserve’s site). Yellow Dog Watershed Preserve’s site features this photo — dated August 6th — and other photos of the perched seep’s destruction. Let’s be clear. The Road Commission has undertaken this “upgrade” of County Road AAA for the mining company; there is no other reason for the work, and no other reason to advertise the work as an upgrade except to pretend that the Eagle Mine haul route will benefit the public in some way. The truth could have been stated in a single sentence: Lundin will be the primary if not the sole beneficiary of the road work on the AAA. Pepin’s article never comes close to stating that one simple fact, and never even hints at the controversy over the haul route that led to this disaster. But this is about more than shoddy journalism or what might even be a case of corporate capture at the editorial offices of the Mining Journal. As Lundin prepares to bring Eagle online, and as the mining boom proceeds all around Lake Superior, clear lines of accountability are critical — and need to be carefully drawn. Big miners continue to “de-diversify” and juniors are trying to scale up: in the turmoil, we’ve seen mine properties around Lake Superior flipped (e.g., Copperwood, or Eagle itself); others, like Twin Metals, thrown into limbo; and who can tell what effects Lundin’s big South American acquisition of Freeport’s Candelaria (in partnership with Franco-Nevada) will have in this northern district? In a situation like this, where ownership stakes are changing hands and companies are exerting undue influence over public officials, accountability can get blurry and responsibilities neglected. The last thing we need — when the future of Lake Superior itself is at stake — is a compliant and servile press adding to the confusion. This entry was posted in Business and Society, Governance, Lake Superior, Prosperity and tagged AAA Road, accountability, Candelaria, Copperwood, corporate capture, corporate power, denial, destruction, Eagle Mine, environmental collapse, environmental disaster, ethics, freshwater, groundwater, haul road, honesty, integrity, John Pepin, journalism, journalistic ethics, Lake Superior, Lundin Mining, Marquette Mining Journal, mining boom, responsibility, Twin Metals, Water, Yellow Dog Watershed Preserve on August 24, 2014 by lvgaldieri.